Whether it’s fair or not, the finance industry has a reputation for using lofty language, opaque jargon, boring, cliched visuals and generally just dry content. Finance marketers face the difficult task of communicating complicated subjects to an audience who may not be familiar, or particularly interested in them. From conveying the relative benefits of intangible investment products, to encouraging people to plan for their future, getting engagement can be a struggle. The eternal question of how we get people, particularly younger people, to engage in their finances, is not helped by the industry’s traditional approach, so maybe it’s time to look at alternative approaches. Over the past few years, we’ve seen a trend where brands, both within the finance industry and beyond, have sought to convey a higher purpose through their advertising. In recent campaigns, banks and insurers have gone all-in on sentimentality in their efforts to attract customers and build brand loyalty. There was Westpac’s ‘Help. It’s what Australians do’ and NRMA’s similarly-positioned ‘Help is who we are’, where big statements and impassioned storytelling were at heart and centre. Both big budget adverts use tear jerking tracks and show people saving lives. Perhaps my friends are cynics, but the question they have asked, is: what has this got to do with banking or insurance? Are these towering aspirations of the brand really resonating with customers? What do customers want from financial services? Millennials’ and Gen Z-ers are sceptics. They question ethics, are attracted to companies that have a positive impact on society and are not afraid to hold businesses to account. These campaigns only work when brands are putting their money where their mouth is. Especially as the Royal Commission is telling us a different story. We have heard banks are deliberately confusing customers with ‘100-page product disclosure statements" and forcing customers to get stuck in deceptive deals. From our own research, people's’ expectations and trust in banks and insurers has taken a bit of a hit. Within the industry and outside of it, there seems to be a general fatigue towards insubstantial claims and mawkish messaging. The call for honest and tangible communication is clear. Customers want to see truth and transparency. While it’s true that customers connect to brands emotionally, it can fall flat if the emotional message lacks substance and truth. So how do we relate to customers again? Financial institutions should be following through on values they claim to have, and demonstrate how they make customers’ lives better. If you can improve someone’s day rather than ruin it, isn’t that the ultimate victory for you and the customer? One way this could be achieved is through appealing to the good old Aussie sense of humour, creating an emotional connection through breaking down the usual stuffy approach. Here are three ways financial institutions can put some fun back into their marketing. People are prepared to take notice if you offer an alternative. We have already seen a shift in language with fintechs and some banks making their products and communication as user-friendly as possible. Take Monzo, the mobile-only bank that launched in 2015 in the UK. When Monzo came onto the scene it entered the public conversation and got people talking about – gasp – finance. Their tone of voice guidelines state communication with customers should be easy to understand. They suggest using words like ‘help’ instead of ‘assistance’ and ‘get’ instead of ‘obtain’, smashing traditional banking language out the park, and still being fully compliance-friendly. Humour can engage audiences while providing light relief to complex terminology and hard data. We have seen a few Australian financial organisations take advantage of this. ING have used comedic actor Isla Fisher in their ads as a brand ambassador, offering a left-field character to promote its services. Due to their success, they have already run three seasons, which justifies banking doesn’t have to be austere or earnest. ANZ were able to tie in humour and purpose effectively when they celebrated 10 years of support for Sydney’s Gay and Lesbian Mardi Gras. They temporarily changed their identity to GAYNZ and gave one of their branches a complete overhaul. The store was embellished in a Liberace-like fashion, with pink poodles, mermen painted on the walls and drag queen stain glass. This was the perfect example of a bank standing for their beliefs (in this case: diversity, inclusion and respect) with their long-term support of the parade as well as using humour in the execution. The new finance app for freelancers ANNA uses a hand drawn logo and a friendly tone of voice to accompany charming character illustrations that give it humanity. With lines like, ‘Invoices. Schminvoices’ and ‘Admin. Tamed’ it speaks to freelancers and small businesses in a universal, no nonsense approach. Daljit Singh, chief creative officer at ANNA stated that he wanted to break the mould in finance by ‘making people smile’. With banks and companies pushing the use of AI, having a human tone-of-voice is a great way to ensure you don’t alienate the user. There has also been some enticing branding from the peer-to-peer digital payment app and debit card Venmo. Aimed at digitally savvy audience, they took a human centred approach to creating bank cards by launching a vertical design. Finances can be regarded as a chore for many, so if financial institutions can find a way to communicate to their audiences in an optimistic, bold and personable way, they are challenging the conventions of the finance world and hopefully gaining new customers along the way. Here’s to putting the fun into finance. 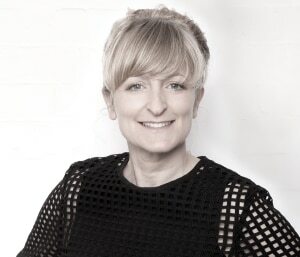 Elly Clark is co-founder at financial services specialist agency Yell.